If you're looking to view or export your Internet browsing history from your iPhone, iPod Touch or iPad to your computer, you can use TouchCopy for this. The software will also display and export your internet bookmarks. This can be particularly useful if you've bookmarked or visited a web page on your iPhone on the go - you can them use TouchCopy to copy those web sites over to your desktop browser. You can preview the web pages in TouchCopy itself or your default web browser on your PC or Mac. TouchCopy can also save an internet shortcut link to your computer. Please visit the TouchCopy user guide for more information on how to export Internet bookmarks and browsing history to your computer. 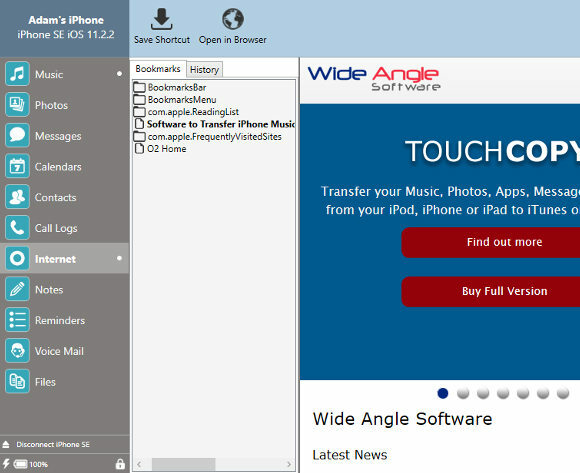 TouchCopy is a free trial download for PC and Mac and it is compatible with all iPod, iPhone and iPad models. TouchCopy does not perform any jailbreaking or modification of your device.